I'M ALWAYS LOOKING FOR DESSERT "CHEATS." Basically, I want my cake and eat it too. AND GUESS WHAT? THESE BROWNIES DO THAT! Not only are they dairy, gluten, and grain-free. But they're also very low in carbs, about 2 net carbs, and they're even paleo if you use the coconut sugar instead of xylitol. SO WHAT'S LEFT? ARE THEY MADE WITH AIR? No....but these ingredients are carefully chosen for their flavor as well as for what they leave out. To make a great brownie, YOU'VE GOTTA HAVE BUTTER AND it's still in here too. And of course YOU'VE GOTTA SWEETEN THEM. Here you have a few choices. Xylitol, a calorie-free sugar substitute that will make these sweet without the negatives of cane sugar, as well as make them lower calorie. Xylitol does have one caution though. If you eat alot of it, it can have a laxative effect on your body. But you can also use coconut or regular sugar if you like. Eggs and almond flour hold them together along with a high quality cocoa powder. After all, the better the cocoa, the better the brownies will be. I like Dutch processed, and my fave is always Valrhona. Whenever chocolate is in a dessert recipe, I always tweak it by adding some espresso powder, pure vanilla extract and salt to highlight all the flavors. 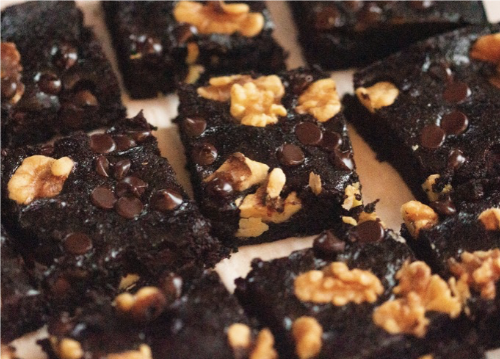 THESE ARE SUPER EASY TO MAKE, SUPER FUDGY AND SUPER GUILT-FREE---THE PERFECT "CHEAT!" 1. Make sure to use an heavy-bottomed saucepan. Melt the butter first, and then add the cocoa, xylitol, salt and espresso powder, stir over very low heat until smooth and the sugar is mostly melted. 2. Dutch processed cocoa is my favorite, but natural cocoa powder will be delicious as well. When you measure, lightly spoon the cocoa into the 1/2 cup and Tablespoon measure, leveling off the top. Packing it in will result into much cocoa in the recipe. 3. Don't overbeat the eggs, just enough to break them up. Overbeating them will result in a more cakey brownie. 4. Start testing at around 15 minutes to make sure they don't over bake. 5. Placing the baked brownies in the freezer for about 15 minutes will make them easier to slice. 6. Try swirling in 1/3 cup creamy peanut butter into the batter before baking. Place a rack in the lower third of the oven and preheat to 350 degrees F. Lightly coat an 8 x 8 inch square baking pan with softened butter. Line it with parchment paper on the bottom and up the sides (to use as handles for easy removal). Then re-butter the bottom of the parchment lined pan. Set aside. In a medium -sized heavy bottomed sauce pan over medium heat, melt the butter. Stir in the, xylitol or sugar, cocoa powder, espresso powder and salt. Turn the heat down to low, and stir constantly until the sweetener is mostly dissolved and the mixture is smooth. Scrape the mixture into a medium-size mixing bowl and allow it to cool for a few minutes. In a small bowl lightly beat the eggs and vanilla together. (don't overbeat) Pour the eggs into the chocolate mixture and whisk or stir just until combined and smooth. They will become cakey instead of fudgy if you over mix the batter. Stir in the almond flour until fully combined. Pour the batter into the prepared pan, and evenly sprinkle the chips and nuts all over the top. Bake for 20-25 minutes or until the center is just set and a toothpick inserted in the center comes out moist. Start checking at 15 minutes, just to be safe. While they are still hot, sprinkle with the flaky sea salt, if desired. Allow the pan to cool completely. Using the parchment sides, lift the brownies out of the pan and cut into 16 pieces or larger if you like. To get extra clean edges, you can place them in the freezer for about 10 minutes first before cutting. Makes 16 fudgy brownies. YUM!